We were up bright and early and standing at the Transit Trolley Bus stop at 06:55 ready for the 07:05 service. Normally they are bang on time, but by 07:10 it hadn’t tuned up and we were getting worried as this was the first bus of the day and had yet to have a good reason for running late. Fortunately is appeared a couple of minutes later. Durango was founded by the Denver & Rio Grande Railway company in 1880. 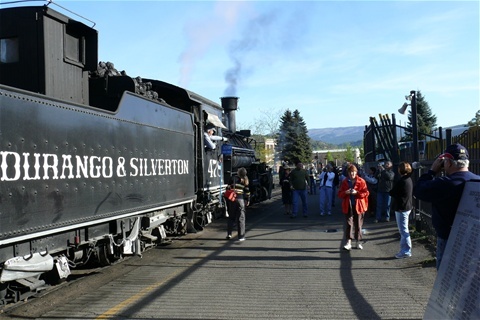 The railway arrived in Durango on August 5th 1881 and construction on the line to Silverton began in the autumn of the same year. 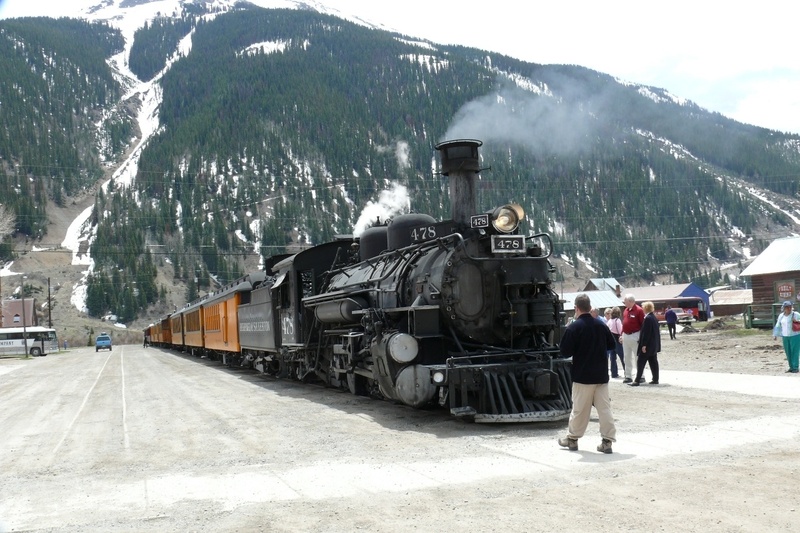 Just nine months later the track was completed and the train began transporting both freight and passengers, though the primary reason for building the railway was to transport silver and gold ore down from the San Juan Mountains. It has been in continuous operation for 127 years, though has faced many challenges during that time. On arrival at the railway station we had a quick look round and then went to find our allocated carriage seats as we are required to be seated 30 minutes before departure. I then left The Chef minding the seats and bags whilst I walked up to the front to the train which was now attached to the carriages and took some photographs and video shots. Back onboard our Durango to Silverton steam train www.durangotrain.com we had a presentation from a young lady member of the crew explaining the merchandise which was available to buy onboard including a large insulated souvenir mug of the railway for $6.50. The train left on time at 08:15, and soon afterwards another member of staff came through carrying an armful of the souvenir mugs. Nobody was interested until we were told they were free, and then of course everybody wanted one. For some strange reason our carriage qualified for the mug free of charge (though perhaps everybody onboard was being told that), and that we were entitled to go to the refreshment carriage and fill it with hot drinks as often as we liked throughout the journey. Twenty minutes or so later we passed our RV campground and waved to our 'home' which we'd left behind an hour and a half earlier. 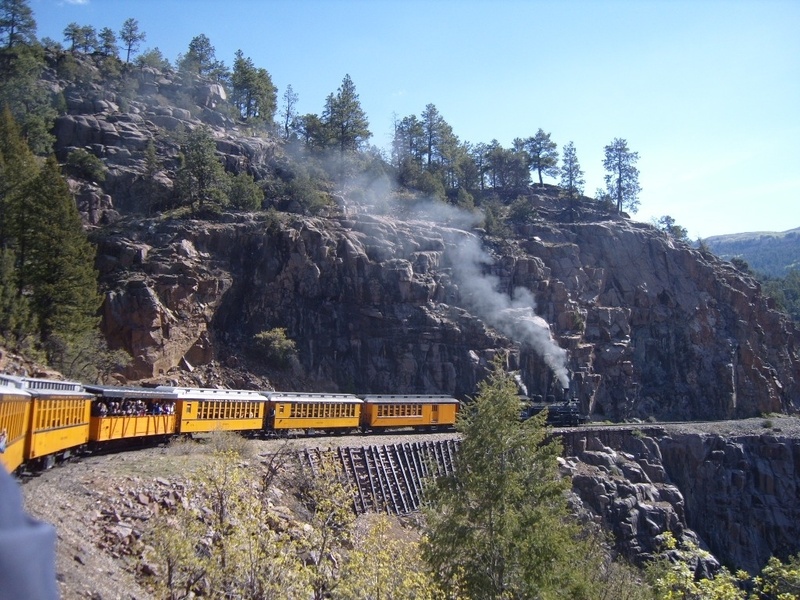 The trip from Durango to Silverton takes 3½ hours, and is an absolutely wonderful experience. The track runs beside the fast-flowing white water of the Animas River for much of the time, climbing up in to the wooded and snowy San Juan Mountains. We had not managed to secure seats on the favoured right side of the train, but no matter, once everybody chilled there was a good team spirit and everybody was helping one another to get a good picture no matter which side of the train something photogenic came up on. I was so very pleased with our choice of carriage. We picked the Grande Class Rio Grande which is one up from the basic gondola, with more comfortable seats and more importantly no kids under 12 allowed! Neither gondola carriage has any glazed windows to the sides. The next carriage forward of us was laid out with forward facing double seats down both sides and the tickets cost more. The passengers in there looked more like commuters; they showed little enthusiasm for the experience, certainly in the early stages of the journey. Compare that with the passengers in our carriage, second from the back of the train, who were hanging out of the side of the carriage to take photographs, there were no dirty windows to take pictures through or people to lean over, it was definitely the best choice of carriage. The only drawback was the smuts from the engine getting in our eyes & hair, but that’s all part of the experience. I found sunglasses reduced the number of smuts in the eye, but didn’t eliminate it. Swimming goggles or wraparound sunglasses would do the trick. After two stops to take on water along the way we arrived in Silverton at 11:45. 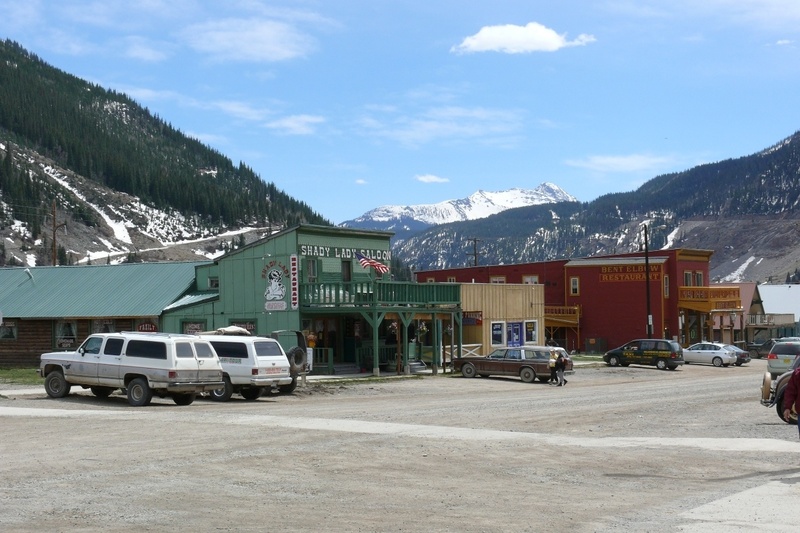 This was a real mining town, though these days it’s geared to tourism as there hasn’t been any mining for a few years. They used to mine silver by the ton here and that’s how the town got its name. Apparently there is talk of reopening some of the mines as the price of silver continues to rise making them potentially profitable again. We caught the last bus back to the train station in Durango at 14:45. We had an interesting drive back with a narration from the driver. It gave us another view of the area, including a climb to something like 10,500ft at one point. There were also roadwork’s which caused long traffic delays due to resurfacing of the whole road from Durango to Silverton. This road formed part of our planned route from Durango to Moab tomorrow but having observed the obstacles including a long steep climb out of Durango and the traffic delays, we decided to go a different route which will be shorter, safer and less stressful. We have invested a lot of money in owning the RV and so have to consider what’s best for ‘her’ as well. On our return to Durango railway station we purchased a souvenir china mug to add to our collection and then caught a trolley bus back towards the RV campground. We jumped off a couple of stops early and had a ‘Real Texas’ meal of ribs. I’m just glad I don’t live in Texas that's all I can say, it was nothing special and we bought half the ribs back wrapped in foil which we’ll have for a meal tomorrow after arriving in Moab. Today has been a long one but one we thoroughly enjoyed, the train ride is an absolute must for any visitor to the area.